View from S, with Georgina Brown (RCAHMS) in shot. View from the W, with Georgina Brown (RCAHMS), in shot. 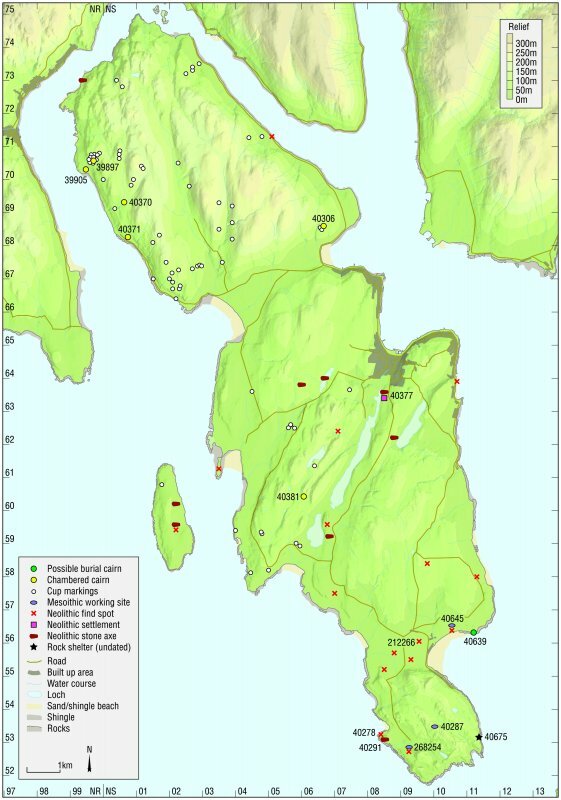 Map - Distribution of Mesolithic and Neolithic sites and artefacts. 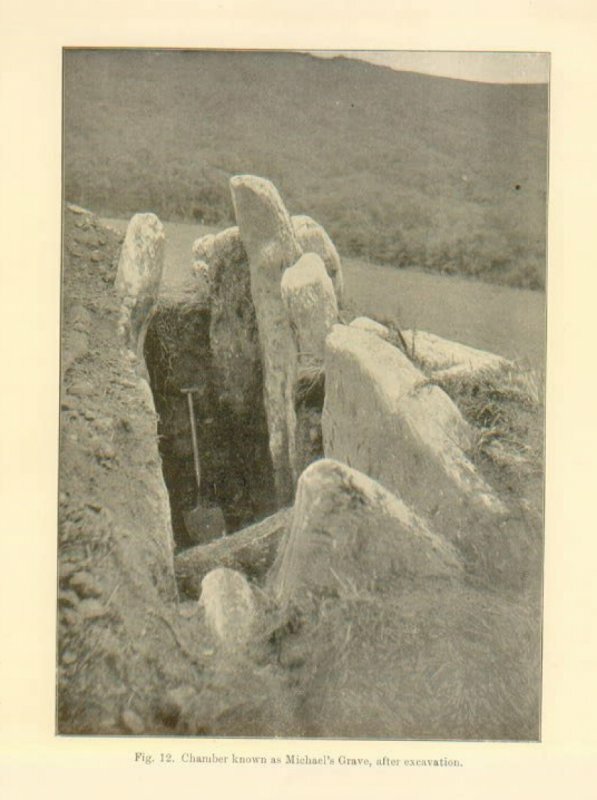 Image from Bryce 1904, 19. Plan from Bryce 1904, 20. 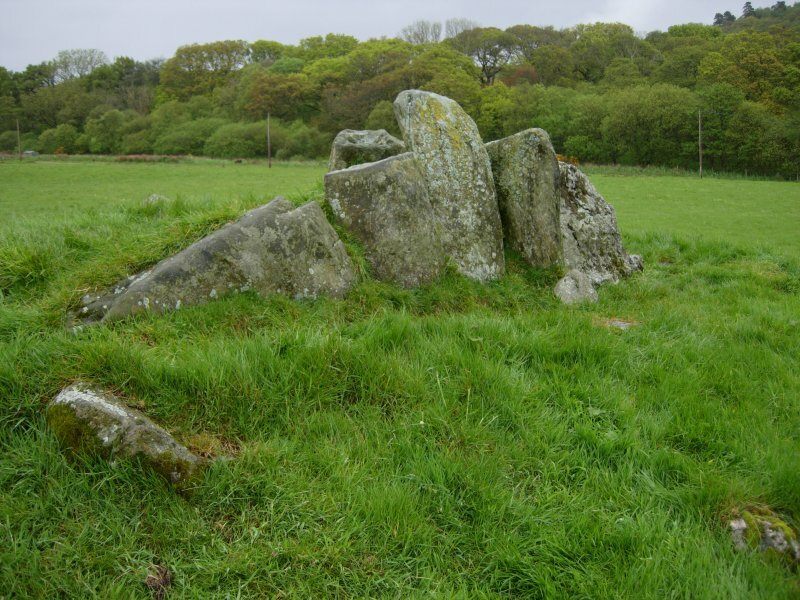 Michael's Grave (Henshall 1972; Scott 1969; Bryce 1904) Little remains of this Clyde- type chambered cairn, and its edge is now defined by the limit of ploughing; in 1962 it was 26' across and 3'-5' high against the chamber. The outside of the S side of the chamber is exposed; the chamber itself is full of debris, and due to the slope of the site, silting has covered all but the tops of the two eastmost slabs of the N side. Excavation in 1903 revealed the chamber, oriented along the contour to face ESE. It measured 10'6" by 2'6", divided into two equal compartments by a septal stone. The floor of each compartment was covered by a layer of black earth with charcoal. Items from the chamber, now in the National Museum of Antiquities of Scotland [NMAS], are an undecorated pottery sherd and a lump of pitchstone (Accession no EO 301). Other sherds, a flint flake, fragments of burnt human bones, a tooth of a pig and ox bones, also found at the same time and place, are now lost. T H Bryce 1904; J G Scott 1969; A S Henshall 1972. 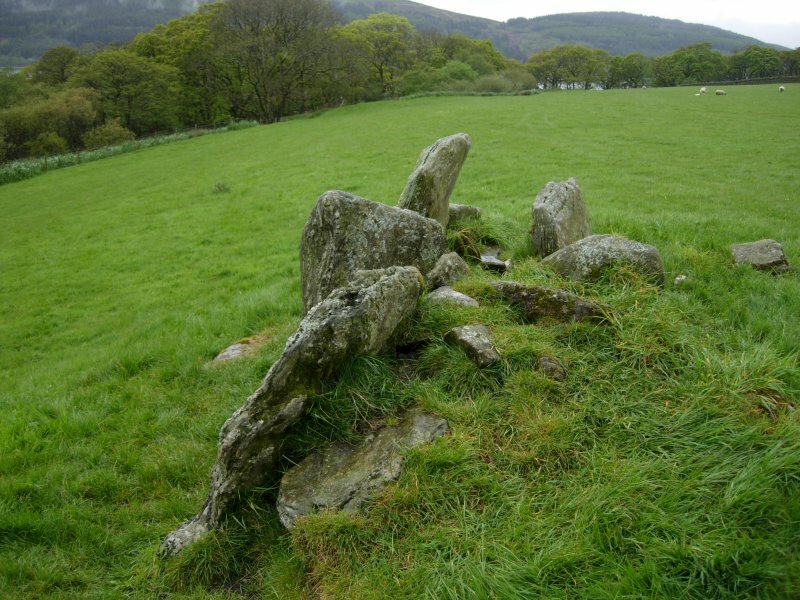 A chambered cairn as described in the previous information and measuring 13.0m ESE by 4.0m transversely. Lying to the S of the chamber is a probable capstone measuring 2.1m by 1.4m by 0.2m thick. The name St Michael's Grave was confirmed locally. Visited by OS (B S) 29 October 1976. 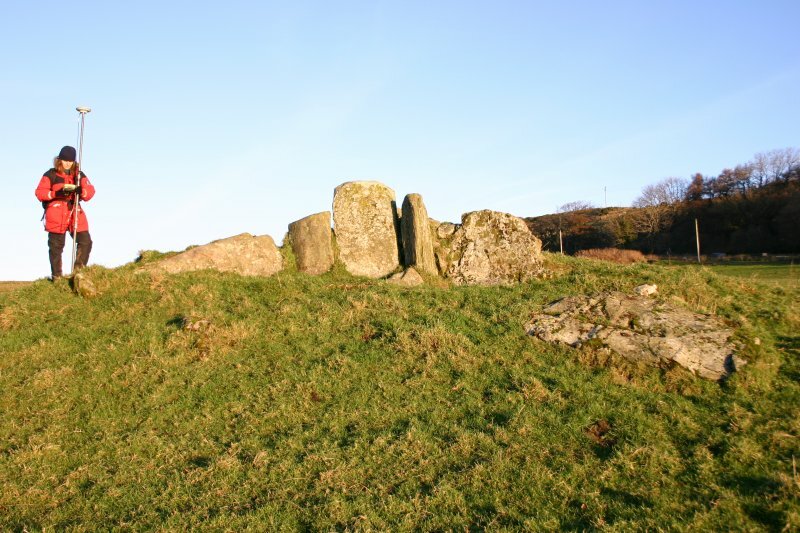 This chambered cairn is situated on the leading edge of a S-facing terrace in a field of pasture about 500m S of Kilmichael farmsteading. 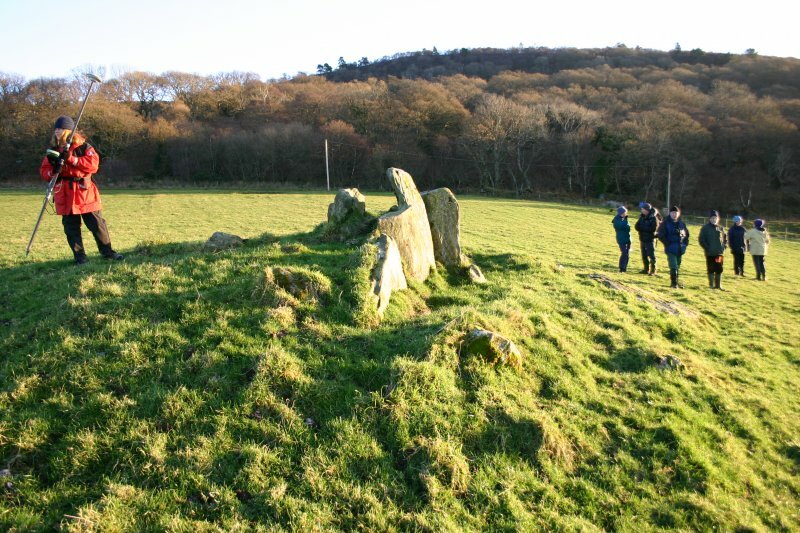 The cairn has been severely reduced by robbing and ploughing and now measures 10.5m from E to W by 7.2m transversely and no more than 1m in height. 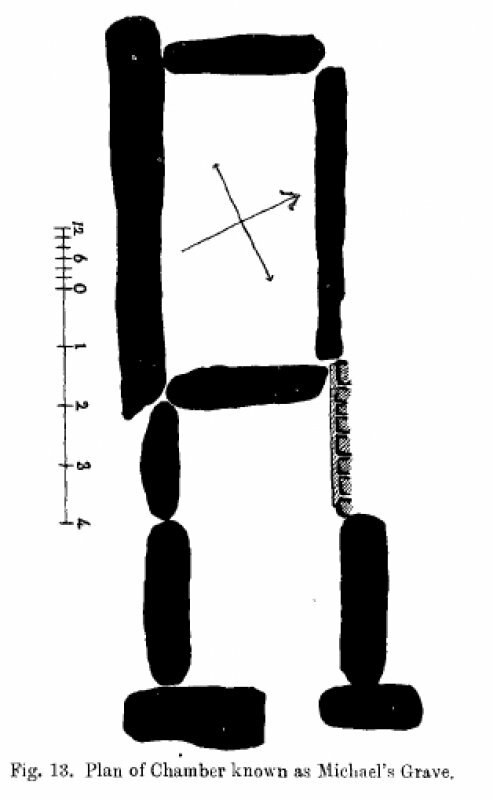 The burial chamber, which was shown by excavation to contain two compartments, measures 4.9m from E to W by 0.8m overall and up to 1.3m in height on the S. Its interior is now choked with rubble, and a displaced capping stone, measuring 1.4m by 2m and at least 0.2m in thickness, lies immediately to the S.
Visited by RCAHMS (GFG, PM), 19 May 2009. Visited by RCAHMS (GFG, PM) 19 May 2009.